CNAS’ leading role in Obama-era policy-making was highlighted when in 2009 the organization’s cofounders—Michele Flournoy and Kurt Campbell—as well as several other CNAS scholars were tapped to serve in the administration. Flournoy became the undersecretary of defense for policy, the same post held by the controversial neoconservative figure Douglas Feith during the first George W. Bush administration. Campbell was tapped to serve as the State Department’s lead Asia expert. Several CNAS principals were also named to the Defense Policy Board, the in-house Pentagonadvisory board which, under the leadership of former chair Richard Perle, played a role in promoting an expansive “war on terror” during the Bush administration. In October 2014, CNAS cofounder and CEO Michele Flournoy was named to the twelve-member President’s Intelligence Advisory Board (PIAB), an independent body with the task of advising the president on intelligence matters. Flournoy, who served as a foreign policy surrogate for Barack Obama’s 2012 presidential campaign, was floated as a possible candidate for secretary of defense in the second Obama administration amid efforts by “pro-Israel” activists to scuttle the nomination of former Sen. Chuck Hagel (R-NE). Writing for The New Republic, blogger Molly Redden—who called CNAS “a pipeline for the young and talented individuals who now populate the lower ranks of the Department of Defense”—described Flournoy as “the name that conservatives have floated as an alternative” to Hagel, although Redden argued that this was more out of neoconservative opposition to Hagel than support for Flournoy. CNAS’ board of directors—led by former Clinton Secretary of the Navy Richard Danzig—has included former Clinton Secretary of State Madeleine Albright, retired Sen. Joseph Lieberman, former Bush Deputy Secretary of State Richard Armitage, former Lockheed executive and Center for Security Policy adviser Norman Augustine, and Mitt Romney adviser Mitchell Reiss. In addition to representatives from corporations like Boeing and JPMorgan, CNAS’ board of advisers has included well-known liberal hawks like Anne-Marie Slaughter and Michael O’Hanlon, as well as conservatives like Paula Dobrianksy and Julie Finley. Among its activities, the organization hosts conferences, publishes blogs, and runs dozens of projects devoted to U.S. security interests in various countries, as well as on security issues related to defense spending, climate change, and the Internet, among many others. CNAS has housed a number of blogs and online publications, including the “Natural Security Blog” and “Abu Muqawama,” a widely read blog on counterinsurgency that was run by former CNAS scholar Andrew Exum (the blog shut down in October 2013). Exum is a retired U.S. army soldier and a former fellow at the hawkish, “pro-Israel” Washington Institute for Near East Policy. CNAS also maintains “Flashpoints,” an online publication devoted to chronicling developments in the South China Sea. Yet rather than warning against future such incursions, the report concluded simply that U.S. policymakers should “internalize these lessons … when intervening elsewhere in the future.” A contemporaneous CNAS report advocated increasing bilateral U.S.-Iraqi security ties while also warning Iraq’s government against crossing a number of “red lines” regarding its domestic and regional politics. On the other hand, CNAS scholars have also warned against military intervention in Iran or Syria. In a February 2012 report on Syria, for example, Marc Lynch warned that while the United States should apply firm diplomatic pressure against the Assad regime, armed intervention would only exacerbate the conflict. “Military intervention will allow Americans to feel they are doing something,” he wrote. “But unleashing even more violence without a realistic prospect of changing the regime’s behavior or improving security is neither just nor wise.” Lynch also counseled against providing arms to Syria’s opposition, warning that it could prolong the conflict and lead to an eventual full-scale intervention. Similarly, a June 2012 report cautioned U.S. policymakers against limiting their diplomatic options with Iran. “All options, including preventive military action, should remain on the table, but policymakers should recognize that the potential risks and costs associated with using force are high,” its authors wrote. “Military action should remain a last resort, which should be contemplated only by the United States and only under stringent conditions”—namely, only if “Iran appears poised to weaponize its nuclear capability,” which it suggests is not currently the case. A May 2013 report by Colin Kahl, Raj Pattani, and Jacob Stokes built on this work, concluding that while "the commitment to use all instruments of national power, including the possible use of force, to prevent Iran from acquiring nuclear weapons should remain firm … this preference for prevention should not be used as an excuse to avoid thinking through the requirements for effective containment." The report argued that because Iran could likely develop a nuclear arsenal even if the United States and its allies tried to stop it, Washington should develop a strategy for containing and deterring that includes options in addition to the use of force. The authors recommended promoting political reform in the Gulf region, bolstering regional missile defense capabilities, adopting a "no-first-use" pledge and encouraging Israel to do the same, ramping up counterterrorism operations, and explicitly disavowing regime change as a goal of U.S. engagement with Iran in the event of a crisis. They wrote that the goals of U.S. policy should be deterrence of "Iranian nuclear use and aggression," defense of U.S. national interests, disruption of Iran's "destabilizing activities," de-escalation of regional crises, and denuclearization of the Gulf. The Inter Press Service (IPS) linked the report to an emerging elite consensus toward "calling for more emphasis on the diplomatic track" with respect to U.S.-Iranian relations. Alongside the CNAS report, IPS observed, "recent reports by blue-ribbon task forces of The Iran Project, the Atlantic Council, the Carnegie Endowment, and the Center for the National Interest have shown a developing elite consensus in favor of greater U.S. flexibility at the negotiating table." Despite its centrist reputation, CNAS has cultivated relations with a number high-profile right-wing politicians and neoconservative pundits and pressure groups. The hiring of Eliot Cohen in 2014, discussed above, is a case in point. 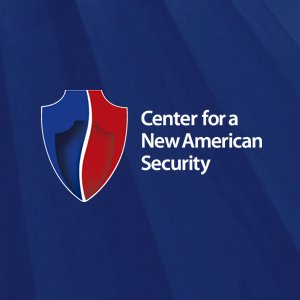 CNAS drew attention in early 2009 when its president at the time, John Nagl, participated in a conference hosted by an advocacy group founded by William Kristol and Robert Kagan called the Foreign Policy Initiative, which is viewed by some observers as a successor to the Project for the New American Century. The March 2009 conference, titled “Afghanistan: Planning for Success,” was striking for its support for President Obama, who had recently announced plans to send 21,000 new troops to Afghanistan. A bipartisan group of officials and policy wonks—including Sen. John McCain (R-AZ), Robert and Frederick Kagan, Rep. Jane Harman (D-CA), and Nagl— praised Obama’s escalation policy. Shashank Bengali and Matea Gold, “Policy ace Michele Flournoy could be first female Defense chief,” Los Angeles Times, January 4, 2013, http://www.latimes.com/news/nationworld/nation/la-na-flournoy-profile-20130104,0,7163092,full.story#tugs_story_display. 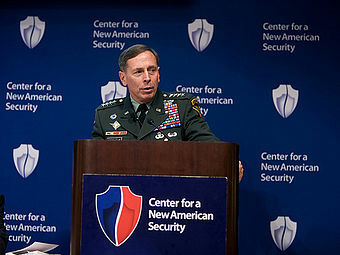 Center for a New American Security, “About CNAS,” http://www.cnas.org/about (accessed July 17, 2009). See Laura Rozen, “CNAS’s Floyd to Defense Department,” The Cable blog, Foreign Policy website, June 6, 2009.http://thecable.foreignpolicy.com/posts/2009/06/06/cnas_floyd_to_defense_department. CNAS, “John Nagl and Robert Kaplan Named Members of Defense Policy Board,” http://www.cnas.org/node/2913. For more on the Bush administration Defense Policy Board, see Andre Verloy and Daniel Politi, “Advisors of Influence,” Council for Public Integrity, March 2003,http://www.globalpolicy.org/component/content/article/168/34719.html; Mark Thompson, “Inside the Secret War Council,” Time, August 19, 2002; and Jim Lobe and Michael Flynn, “The Rise and Decline of the Neoconservatives,” Right Web, November 17, 2006, https://rightweb.irc-online.org/rw/3713.html. CNAS, CNAS CEO Michèle Flournoy Named Member of the President’s Intelligence Advisory Board, 2014, http://www.cnas.org/release/michele-flournoy-named-member-president-intelligence-advisory-board#.VDaiGPldW1e. Molly Redden, “The GOP Likes Michèle Flournoy for the Wrong Reasons, But She's the Right Choice,” The New Republic, December 26, 2012, http://www.tnr.com/blog/plank/111354/why-the-gop-loves-michele-flournoy-hint-shes-not-chuck-hagel#. CNAS, Richard Fontaine bio, http://www.cnas.org/fontainerichard. Christopher Shea, “Resting on their laureates,” Boston Globe, October 24, 2004, http://www.boston.com/news/education/higher/articles/2004/10/24/resting_on_their_laureates/. CNAS, “Dr. Eliot Cohen, Former Counselor of the U.S. Department of State, Joins CNAS as Adjunct Senior Fellow,” October 2, 2014, http://www.cnas.org/release/dr-eliot-cohen-joins-cnas-adjunct-senior-fellow#.VDb6qvldW1d. CNAS, Board of Advisors, http://www.cnas.org/people/boardofadvisors. For more on CNAS programs, see its "Featured Programs" page, http://www.cnas.org/projects. Thomas Ricks, “Farewell to Abu-Muqawama,” Foreign Policy, October 30, 2013, http://ricks.foreignpolicy.com/posts/2013/10/30/farewell_to_abu_muqawama. For a critique of the work of Exum and other COIN scholars at CNAS, see Kelley Beaucar Vlahos, "One-Sided COIN," The American Conservative, August 1, 2009,http://www.amconmag.com/article/2009/aug/01/00038/. Daniel Luban, “CNAS Report is a Sign of the Times,” LobeLog, April 20, 2010, http://www.lobelog.com/cnas-report/. Emma Sky, “Iraq in Hindsight,” CNAS, December 2012, http://www.cnas.org/files/documents/publications/CNAS_IraqInHindsight_Sky_0.pdf. Melissa Dalton and Nora Bensahel, “Revitalizing the Partnership,” CNAS, December 2012,http://www.cnas.org/files/documents/publications/CNAS_RevitalizingThePartnership_DaltonBensahel.pdf. Marc Lynch, “Pressure Not War: A Pragmatic and Principled Policy Toward Syria,” CNAS, February 2012,http://www.cnas.org/files/documents/publications/CNAS_PressureNotWar_Lynch.pdf. Iran, Israel, and the Bomb,” CNAS, June 2012,http://www.cnas.org/files/documents/publications/CNAS_RiskandRivalry_Kahl_0.pdf. Colin Kahl, Raj Pattani, and Jacob Stokes, "If All Else Fails: The Challenges of Containing a Nuclear-Armed Iran," CNAS, May 2013,http://www.cnas.org/files/documents/publications/CNAS_IfAllElseFails_Kahl.pdf. p>	 Jim Lobe, "Nuclear Iran Can Be Contained and Deterred: Report," Inter Press Service, May 14, 2013, http://www.ipsnews.net/2013/05/nuclear-iran-can-be-contained-and-deterred-report/. Tim Starks, “Paul Ryan: Rebuild Military, Stay in Afghanistan Longer, Develop Lasers,” Roll Call, June 11, 2014, http://blogs.rollcall.com/five-by-five/paul-ryan-rebuild-military-stay-in-afghanistan-longer-develop-lasers/. Michele Flournoy and Eric Edelman, "Cuts to defense spending are hurting our national security," The Washington Post, September 19, 2014, http://www.washingtonpost.com/opinions/cuts-to-us-military-spending-are-hurting-our-national-security/2014/09/18/6db9600c-3abf-11e4-9c9f-ebb47272e40e_story.html. - See more at: https://rightweb.irc-online.org/profile/Edelman_Eric#_edn6. Daniel Luban and Jim Lobe, "Neocon Ideologues Launch New Foreign Policy Group,” Right Web, April 15, 2009, http://www.rightweb.irc-online.org/articles/display/neocon_ideologues_launch_new_foreign_policy_group. Daniel Luban and Jim Lobe, "Neocon Ideologues Launch New Foreign Policy Group,” Right Web, April 15, 2009, http://www.rightweb.irc-online.org/articles/display/neocon_ideologues_launch_new_foreign_policy_group; Kelley Beaucar Vlahos, "One-Sided COIN," The American Conservative, August 1, 2009,http://www.amconmag.com/article/2009/aug/01/00038/. “Afghanistan: Internationalism vs. Isolationism,” panel transcript, Foreign Policy Initiative website, http://foreignpolicyi.org/event_trans.php. Kelley Beaucar Vlahos, "One-Sided COIN," The American Conservative, August 1, 2009, http://www.amconmag.com/article/2009/aug/01/00038/.